I almost couldn’t watch, everything changes when success is calling. The first team final I remember in detail was 1985, I have watched every single one since, some in the arena, some in the gym, most at home. The common theme running through all being there was nothing at stake, it’s so much easier to watch when there is nothing at stake. 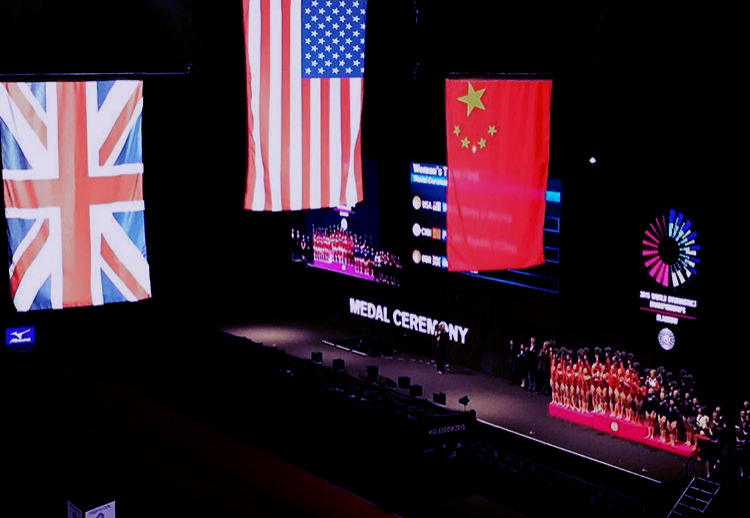 Great Britain has made three world team finals, 2007 where they finished 5th, 2011 also fifth, and then 6th last year in 2014. I sat down last night with that excited, nervous, anticipation that’s been growing more and more as I’ve watched British Gymnasts over the last decade. It started way back every time Beth made European finals, then world finals, it progressed to European team and individual finals, and now here we are, world championship team finals, and there is a genuine possibility that this team could medal. Were we favorites to medal? On paper no, on paper if everyone hit we would place fourth, and that in itself would be immense, as no team has broken the big four of USA, China, Russia, and Romania since Australia in 2003. Paper doesn’t have to get up on the podium in the pressure cooker atmosphere of a world team final and hit though. Where to begin, is it even possible to put into words the magnitude of what happened? 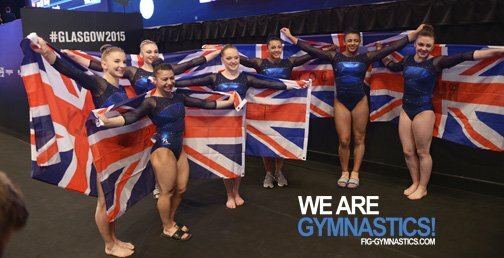 Seven girls just made history for Great Britain, five may have competed last night, six competed in total, but the team of seven made it through the trials, through the weeks of preparation at Lilleshall, earned their place on the team, then achieved their primary objective by qualifying a team to Rio for the 2016 Olympics. This world Championships will be remembered for so much more though. 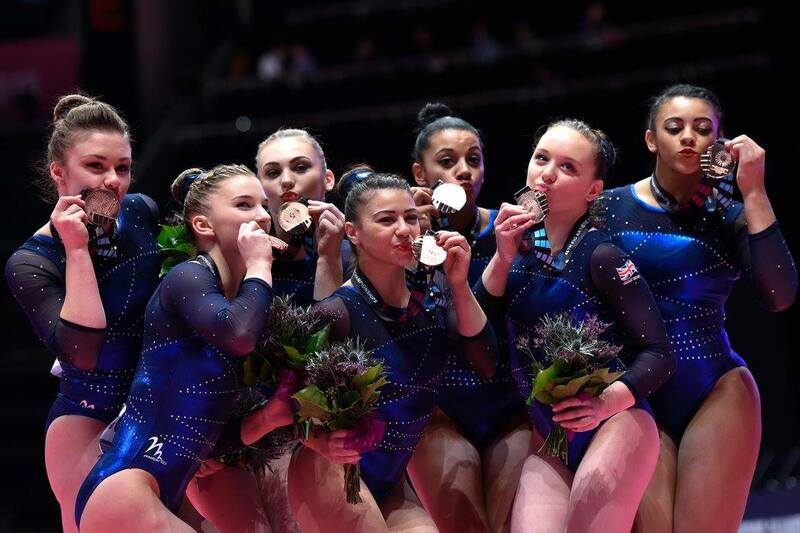 Becky Downie, Ellie Downie, Charlie Fellows, Claudia Fragapane, Ruby Harrold, Kelly Simm, and Amy Tinkler will go down in history as the first ever world team medalists Great Britain WAG has ever produced, I have a feeling they are the first of many. Beginning on bars in absolutely beautiful midnight blue leotards with the traditional Union Jack flag on the back, the British effort began with Ruby. Ruby did a great job for the team, safely through her complex innovative routine including the Maloney to Bhardwaj, and the Van Leeuwen straight to to Zuchold to toe on full. What looked like a higher Jaeger today caught with straight arms, then finishing with a double front with the smallest step. A few leg separation on transitions, but a great opening performance under pressure, and Ruby’s job for the day was done. The tears came as she left the podium, it must have been a huge emotional release for her having fought so hard to return, then hitting when it mattered the most for her team. Ellie returned to the bars after her disappointment during qualification. Would she be able to go clean today? Safely through the opening skill which took her off the bars in qualifying, Maloney to high bar, then immediately into the Tkatchev missing the regrasp and onto the mat. What a rallying performance though, whereas in qualifying after falling she didn’t settle back into the routine, and made several more errors, here she fought her way through to the end. Toe on full into piked Tkatchev, linked straight to the Pak. She was a little off line on the Van Leuween back to the high bar, but kept leg form, and kept the swing going. Beautiful double straight to finish. Becky went for her less complex routine today, no doubt with safety in mind. Clear circle to straddled Tkatchev rather than the piked Shang version from the Chow transition to high bar, lovely toe full right on top of the bar into her own skill the Downie. Pak to low, Maloney back to high, no Hindorf at the end of the routine as she’s used it at the beginning, then a stuck full out. Such quality work beautifully performed. No clear footage of Claudia’s beam as yet, but having fallen in qualification, she was offered another chance to hit her routine. No fall today, a small wobble of the standing full, but kept on the beam. A little adjustment after the free cartwheel, then she did need to fight to control the dismount counting a couple of steps. Good clean work today, and a great performance under pressure. I love the angle of Ellie’s beam, I watched it once watching her, then again watching her team living every single skill with her, and cheering her the whole way through. High punch front to open, completely solid. She would have got hit with a concentration pause deduction before her Arabian, but it was absolutely huge, with just a tiny jump forward. Change to change half, the landing of the second leap brought sharply under control. Double spin, again a little loss of balance, but firmly dealt with, and you could see that there was no way that Ellie was going to allow either a big wobble or a fall. Smoothly through the flick layout, no issues on landing today, free cartwheel, then a high two and a half to finish. Great routine, elation from the rest of the team. Becky Anchored the team, no major errors, but she was downgraded to a 5.3 D score when she went for a 6.0 in this routine. I imagine she wasn’t given the change to ring, but instead of having it downgraded to a D, had it downgraded to a split change, and as she had already done one of those , it wasn’t counted. That would have left her counting an A dance element for 0.1, as opposed to an E valued element for 0.5. Please note this is what I think has likely happened rather than confirmed fact at this point. Becky it seems also had her spin valued at an A rather than a C for not hitting the full position for long enough. That aside, a great performance from Becky, solid front somi to open, no W jump linked this time, but a secure landing. Lovely free cartwheel layout, a little loss of balance on landing causing her to wobble, but quickly saved. Solid spin whether devalued or not, and beautiful leaps. Becky’s arm positions and carriage on her leaps are really worth noting. Back spin which we can’t really see on the video (but she doesn’t seem to have been awarded the connection today), then into the free walkover, not linked to sissone today, but completely under control. Side somi with the tiniest of adjustments, then the contentious change to ring. Great double pike with a pace back on landing, three up, three hit, and we were half way there! Enter 16th birthday girl Amy Tinkler. 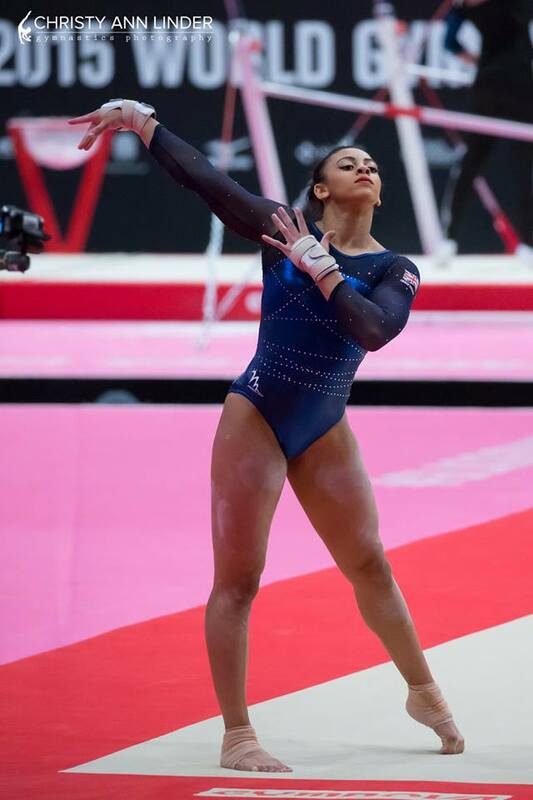 This gymnast is made for competition, her performances so far promise great things to come in these high pressure situations for many years ahead. She looked calm and composed in her opening pose, the music began, and she jumped into action, smile on her face, selling the routine from the start. Big double double opener with a small hop back, then back with double layout again just the small hop. Leap series of change leg, dance through to tour jete half linked to Popa, to straddle quarter. Smiling into the corner, then smiling even more on landing her third tumble of one and a half to two and a half twists, just a switch half, and a big double pike left to finish a fantastic routine. Amy was beaming, the audience erupted, cut to Ruby, Charile and Kelly screaming, arms held aloft. 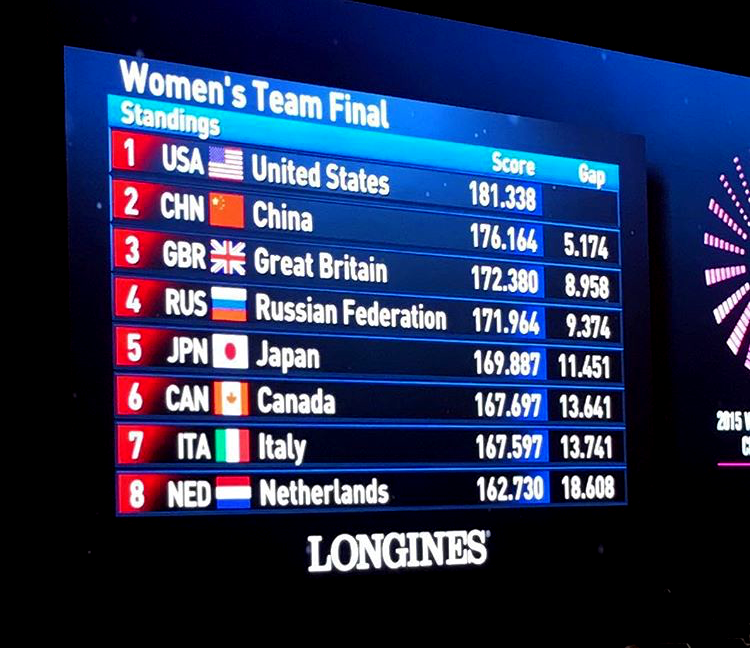 What a routine to kick off your senior world finals level career, even managing to up her qualification score. No footage of Ellie on floor yet, not quite as high in D and E score as qualifying, but still will have been an excellent performance given the score awarded. Claudia injured her ankle during the first trial for this team, so to see her competing at this level at all is a testament to the entire team behind her recovery. For me this is the best she has looked on this piece, and she is much cleaner than earlier in the year when she began to perform this upgraded routine. In interview Claudia has said that she has more upgrades to put in, so I look forward to what she is going to bring next year. Nailed opening double layout with full twist, as high and clean as it’s ever been. She bounced a little to the side from the tour jete full, then moved to the corner for her second tumble. Huge double Arabian, she brought the landing under control with a small step to the side. Third tumble of triple twist, and the most improved area for Claudia I feel. She held the straight position throughout, legs straight fully rotated, exactly how this skill should look. Tour jete half, final tumble of double straight linked to the W jump, enormous smile to finish, and a higher score than in qualifications. I said after qualifications I felt Claudia had really settled into this routine now, it suits her perfectly, and you can’t help but enjoy watching her. I had a big smile on my face as the team headed to vault, a high scoring piece, and here we were with three double twisting Yurchenkos ready to go. What a feeling to have that confidence going into a medal deciding rotation. Claudia went first, a good solid vault, chest a little low on landing, but again definitely improved on this piece. Her twisting form really seems to have cleaned up over the year, she must have worked very hard with eye on the E score here, earning over nine in E score which is excellent . The huge smile again, job done on all three pieces for Claudia, a great competition for her. Amy simply produced the best vault she has ever done in competition, what more could be asked. Steely determination on her face at the end of the vault run, she rocketed off the vault high and straight, wrapped in the double twist with plenty of time, landed bang in the middle, then just hopped to the side to finish. Second day of competition, second time she’s scored a personal best on vault. Happy birthday indeed Amy. So it came down to Ellie, in her fist year as a senior, her first world championships, her first team final, she had the pressure of hitting her vault to secure a medal for her team. What a vault it was, Ellie’s form on to the vault is impeccable, she absolutely flies off the vault, her legs straight, locked together. She finishes her twist with time to spare, lands upright, and is straight down the center. Energy to spare too as she had a bounce back, if she doesn’t have an Amanar by next summer, and a really good one at that, I’ll be very surprised. Ellie made her way back to the team, smiles and hugs from all the coaches and her teammates, the score came in, the team had gone above Russia, and the smiles turned to tears. On qualifications day we saw Becky hugging her sister to comfort her, today tears of joy all round. What an achievement, what a performance from the entire team, every single member. To the gymnasts, personal coaches, national coaches, and home clubs congratulations, you have made history. You are the new standard, you have shown we can do it, in two rounds of competition you have broken the top four then into the top three. An unbelievable evening of gymnastics, I would say an unbelievable outcome, but they were absolutely capable, so really it wasn’t.